Back in January, I noted on this blog that, since the provision came into force in April 2014, only 11 penalties had been imposed on employers under section 16 of the Enterprise & Regulatory Reform Act 2013, and that only four of those penalties had actually been paid. It quickly turned out that the super-computer on which the Department for Business, Innovation & Skills (BIS) stores the relevant data had been having a bad day at the office in January, and that 12 penalties have been imposed, of which six remain unpaid. And, by that time, I had submitted a Freedom of Information request to BIS, asking for the names of the naughty employers who, as well as treating their employers especially badly, in the view of an employment judge, have failed to pay the resultant penalty to HM Government. Five of the six appear to be economic minnows, with little if any internet footprint. Spring Digital, for example, appears to have done very little since 2012, and CE Table Ltd may well have been struck off by now. 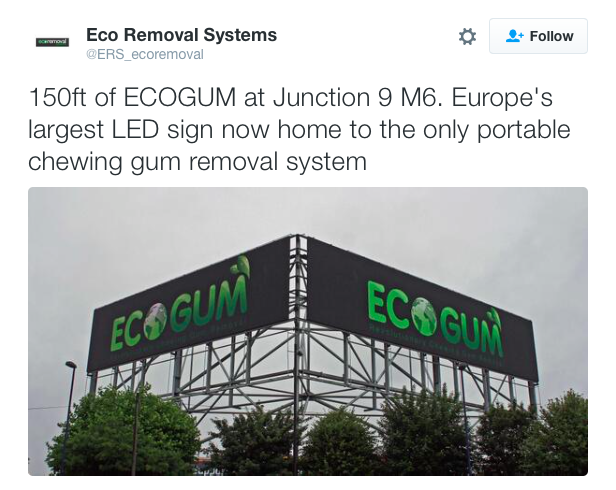 However, Ecogum – or Eco Removal Systems – is an active company providing “an ecological cleaning solution to a worldwide problem … [the removal of] chewing gum, oil, grease, adhesive labels, graffiti, and plain old dirt.” Its clients include Chelsea Football Club, the Twickenham (rugby union), Wembley (football) and Wimbledon (lawn tennis) stadia, and King’s College London. In the last few days, it has tweeted about its work cleaning the streets of Scotland. It believes that “customer satisfaction is totally essential”. But it seemingly doesn’t believe in promptly paying financial penalties imposed by an employment tribunal, in compliance with the law. What, if anything, is BIS (or the Ministry of Injustice) doing about this? In late January – and again on 11 February – BIS minister Nick Boles stated that “enforcement action is currently being considered for the outstanding penalties”. Watch this space. This entry was posted in Justice, Workers' rights and tagged Employment tribunals, s16 penalties. Bookmark the permalink.